The RM650 comes with an 80Plus Gold efficiency certification, therefore we were not surprised by the excellent electrical efficiency results. At 50% capacity and with a 230 VAC input, the efficiency of the RM650 is at 92.1%, just a breath higher than the 92% 80Plus Gold specification limit. 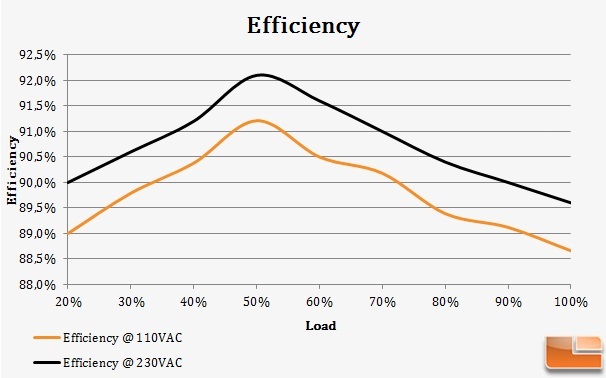 If the input voltage drops to 110 VAC, the efficiency takes a hit of about 1.1% across the entire load range, yet the RM650 still easily fulfills the 80Plus Gold certification requirements. 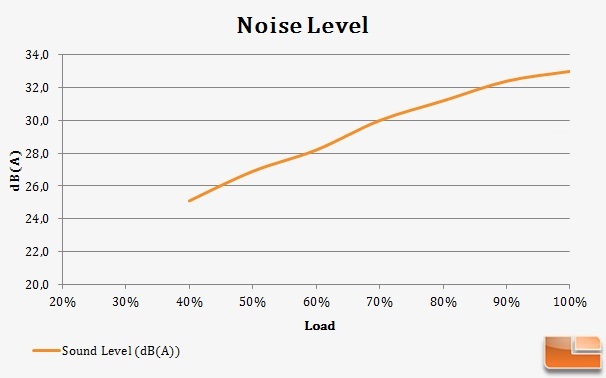 We recorded no noise level readings up to 40% load because the fan was entirely stopped up to that point. When we switched to 40% load, the fan started after a few seconds, yet it may only be heard if someone places an ear very close to it. 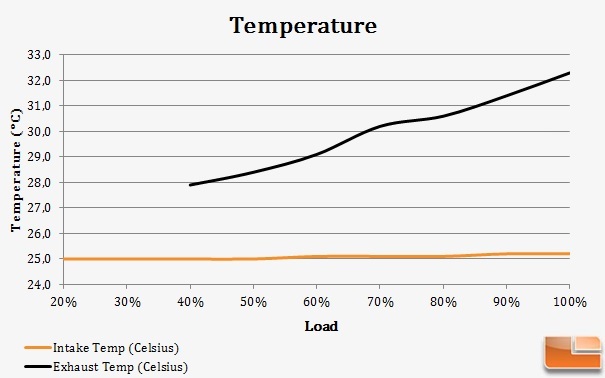 As the load increased further, so did the speed of the fan, which however became clearly audible only when the load exceeded 80% of the unit’s capacity. As the fan did not spin at <40% load, we did not take any temperature readings, as without any airflow any figures would be essentially incorrect. Above 40% load, after the fan starts spinning, the high efficiency of the RM650 helps it maintain low temperatures even while the fan is spinning very slowly. Under maximum load, the temperature delta reached up to 7.2 °C.